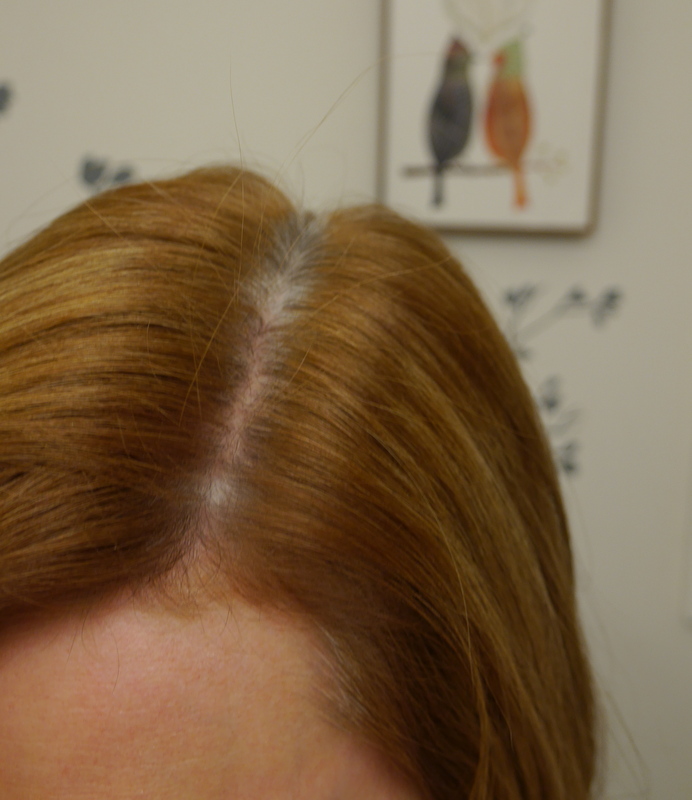 Like clockwork, every three weeks after coloring my hair I’d have a solid white stripe of regrowth. Love strawberry blonde hair, hate looking like a candy cane by the end of every month. Recap from this post, my hair used to naturally be light reddish brown, but started going grey when I was 20. So now I color it. Coloring your hair every three weeks…besides the obvious expense (Oh you wanted to buy a house someday? That’s cute. Go color your hair, Candy Cane Jane. $$$) I also kept thinking, it can’t be good to be putting all these chemicals on my scalp this regularly. 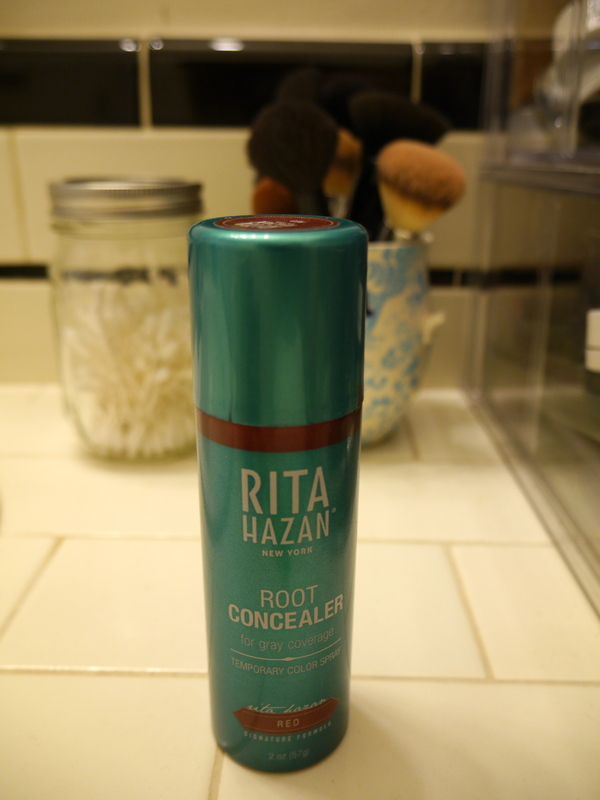 So I was pretty pumped when I saw this Rita Hazan spray on the shelf at Ulta. $25 for 2 oz can. I have tried the root touch up pens in the past and I always felt like the texture on the hair was too clumpy and tacky. I could never get the product to blend with my hair. 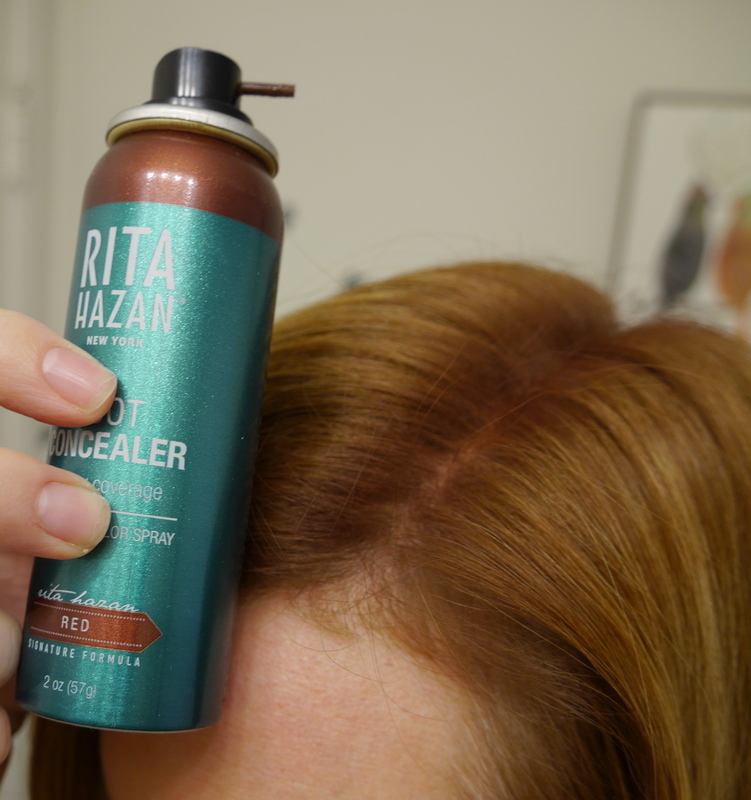 This spray comes in five shades: Blonde, Dark Blonde, Red, Light Brown, and Dark Brown/Black. I have also purchased it from Sephora. I found that while the texture of this spray is also slightly tacky to the touch, it brushes through nicely and loses some of that stickiness. I am a big fan of this spray. Now I’m waiting about 4 to 6 weeks in between colorings and my scalp is very, very happy about that. 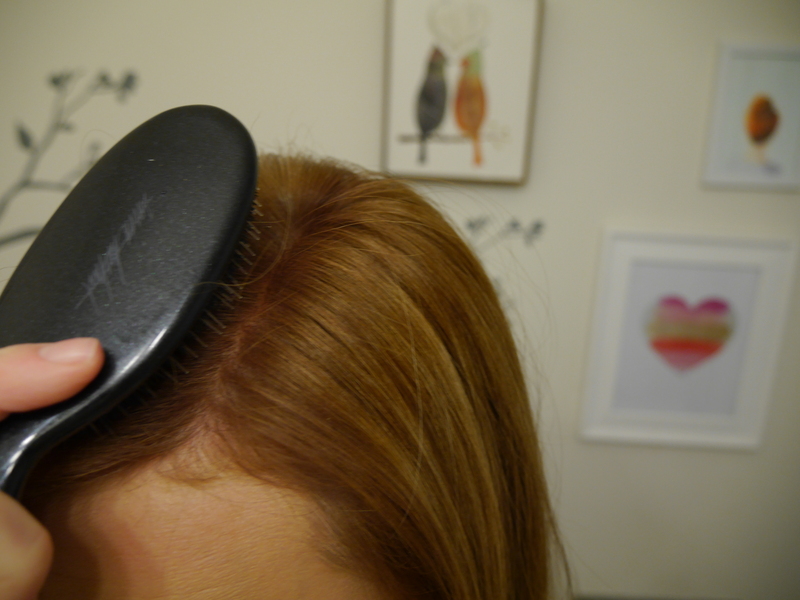 It doesn’t come off when you touch your hair or on pillows or clothes. It holds up through working out without budging and then easily washes out with shampoo. This spray gets an A+ from me. I tried this spray in Dark Blonde and Red. The red comes out a bit darker than my color at first, but then blends nicely when I brush it. 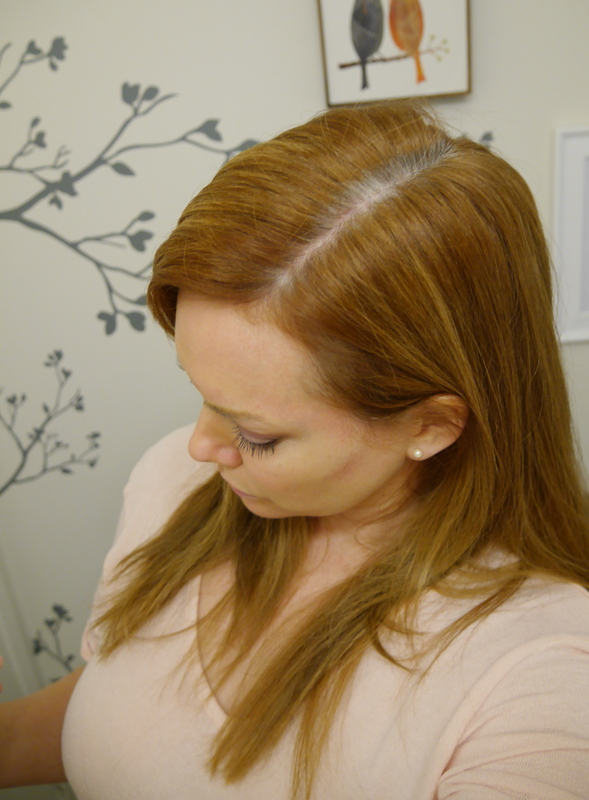 The dark blonde didn’t work for me, as it covered my greys, but didn’t cover my darker regrowth. The blonde shades will cover grey, but not lighten darker hair. 1. 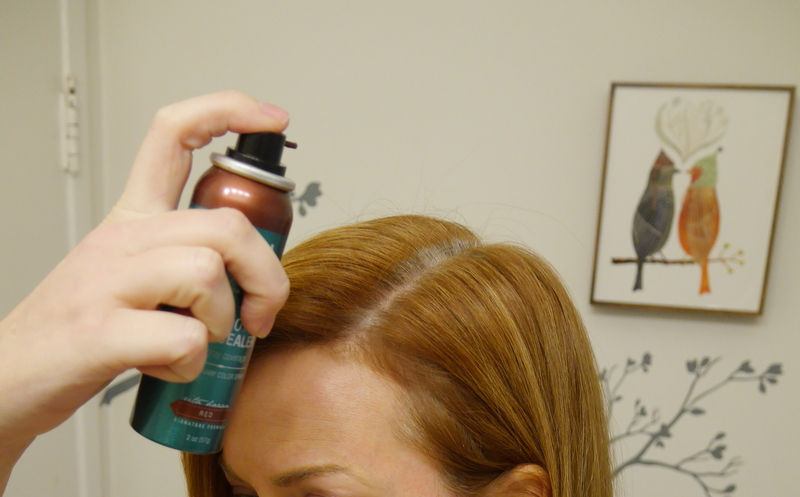 Hold it about 4 to 6 inches away from your scalp while spraying. 2. Cover your forehead, or you can get some spray fall out. 3. Shake the can a lot before using. 4. SPRAY LIGHTLY. You will still get great coverage, it will look more natural, and it won’t be as tacky feeling in your hair. You can always go back over your hair later and add more, but start out lightly. 6. Spray it on your hair and let it sit for five minutes before brushing it through with a boar bristle, or boar and nylon bristle brush. For me, because my hair is more strawberry blonde than a vibrant red, the red could look darker then my dyed hair color. So brushing in through after helped blend the shades and make it look more natural. It also helped soften the texture. I hope this review helps! I know it’s not my usual format for reviews, but I thought a list of the tips I learned along the way would the most helpful. Cover your facey-face! Sometimes the spray splatters when you spray it too far away from your roots. After 5 minutes, brush through with a boar bristle brush. Hi again! I commented before about redoing my roots. I decided I’m going to try this! I think my hair is about the same color as yours, maybe a tad lighter. I’m just nervous about the color being too dark. Also, should I wash my hair before I spray it? Or right after? How should I prepare to use this? So glad the posts are helpful to you! I use this after I’ve washed and styled my hair. I part my hair where I’m going to leave it parted, then spray (about 4 to 6 inches away from my scalp). It lasts until your next wash! My hair color is very similar and I am planning to try this product. First I wanted to ask, how long does a can last for you? Appreciate the post! So glad this post was helpful to you! I have had the same can for almost 6 months. I only spray it on my part so I don’t use that much. I also only wash my hair very 3 days or so (I’m gross! 🙂 ), but the spray does last without any fading or rubbing off the whole three days. I have a back up can ready but my original can is still going strong. Also, I don’t recommend spraying much more than your part, because this product does have a slightly “tacky” texture. I hope this helps! Thanks so much, that’s great news. I wash my hair about as often (or not often, ha) as you so I’m hoping for similar results. Glad I found your blog, you’ve got a new regular! Thanks for the quick response! Thank you that is so nice of you to say! Glad you are part of the blog now too!! am concerned of dyes, etc. Is this product safe ? 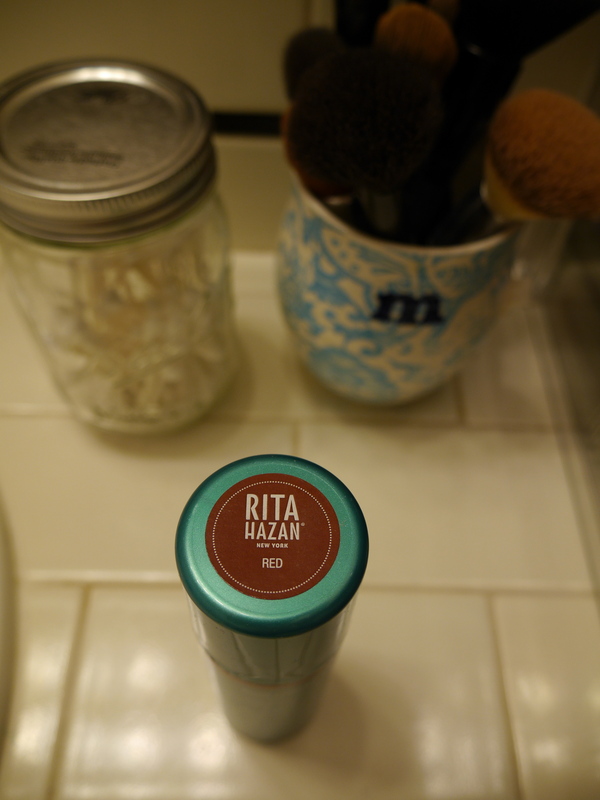 I haven’t had any problems with the ingredients (no allergic reactions or rashes, etc.) but it is not marketed as all-natural or organic. So there are chemicals in it. But it isn’t a hair dye, it’s just a temporary color, so it won’t permanently change the color of your hair. I hope this answer helps! Can u use this spray all over ur hair to temporarily dye ur hair? The spray only covers grey hairs, it won’t temporarily dye any hair that’s not grey. 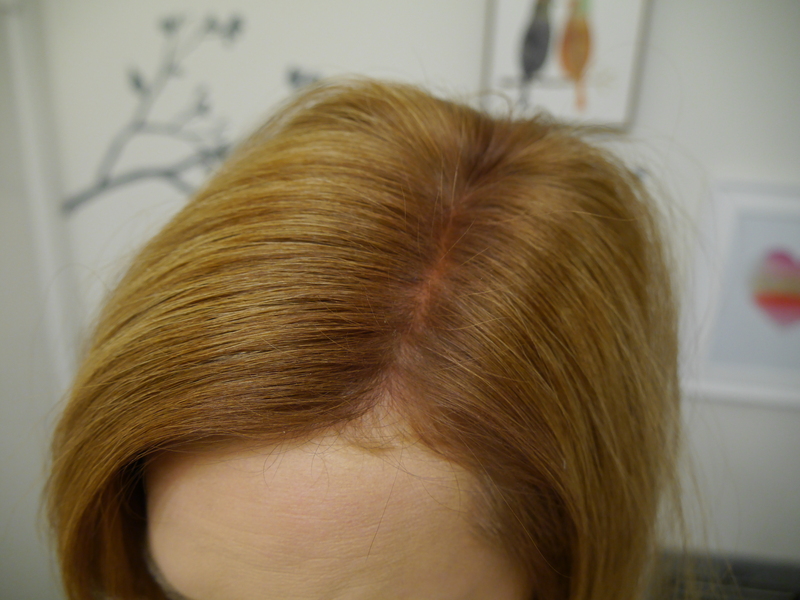 Also, I would only recommend it for roots because it does have a slightly tacky texture on the hair. I hope this helps!